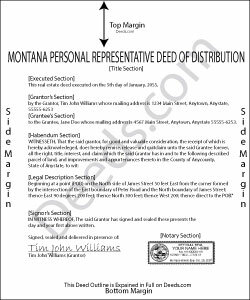 The Montana Uniform Probate Code (UPC), codified under Title 72 of the Montana Code, governs probate in that state. A personal representative (PR), who may also be referred to as either an executor or administrator, is the fiduciary appointed to manage the decedent's estate. The personal representative's deed of distribution is an instrument used in probate proceedings as evidence that a distributee has succeeded to the decedent's interest in real property ( 72-3-904, MCA). PR deeds must meet all state and local standards, and may need supporting information, depending on the situation. Record the completed deed in the county clerk/recorder's office of the county wherein the subject property is located to transfer title to distributees. This transaction requires a Realty Transfer Certificate, but no sales information as per 15-7-307(9), MCA. As always, consult an attorney licensed in the State of Montana with questions regarding Montana personal representative's deeds of distribution, or any other issue related to probate.